Well, despite the reaction to that endlessly reposted photo on Instagram, this car isn’t fake. You can’t blame people who thought that though, as the first time I saw this car on a poster stuck to the wall of a workshop office for a Caroline Racing event at Nikko Circuit, I thought it was just a joke. There was a cartoonish drawing of an S14 Silvia with four turbos sticking out of the engine bay on it, and an equally cartoonish character that looked like Captain Harlock, a space-pirate character from an old comic book series, albeit wearing a baseball cap. “What’s this meant to be?” I asked the workshop’s owner, pointing at the poster. “It’s real, apparently. He said he’s building a car with four turbos on it. That character is meant to be Takuro.” was the response. It made sense. 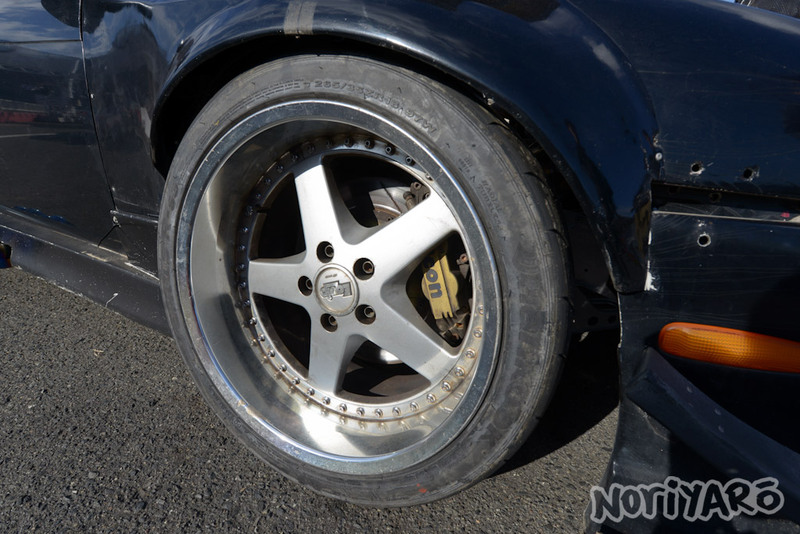 I had no reason to doubt this, as this was the same Takuro who was making ridiculously big angle knuckles long before it became common, and has been known to do things like cut and shorten a sedan to make a 1.5 door, and hack apart a 180SX drifter to make it into something like a tube-frame dragster with an entire fibreglass body over it. He’s also the same guy who intended to turn a Pontiac Fiero-based Ferrari F40 replica into an RB26-powered drift car. While that level of craziness might be a bit too much for the world to handle just yet, I think this quad-turbo S14 Silvia might just be insane enough for the time being. Let’s get one thing out of the way first, because I’m sure there’s a lot of technically-minded people who are reading this to see how it works. This is not really a “quad turbo” setup like on a Veyron, even if it sounds cool to call it that in the post’s title. It’s a custom compound turbo setup that works in a similar way to that used on diesel engines, with two turbos of different sizes working together to create the kind of boost levels and engine responsiveness that couldn’t normally be achieved with huge turbos alone. So is this a drift car or a drag car? According to Takuro, it’s a “tuning car”. Basically, he just likes messing around with things, so there’s no real goal behind it apart from seeing if it can be done. First, let’s have a look at the engine bay and see what path any air that is unfortunate enough to be swallowed by this engine will end travelling along. First, at lower revs, two TD06-17C turbos start creating boost to get the whole thing going. Once the boost levels are sufficient with the smaller turbos, these two T88-34D turbos positioned right up the front of the engine bay create even more boost with the eventual aim being something well over 3 bar. As you can see, this is where air first enters the system. At this point, I’d like to ask that anyone reading this who has some sort of authority to talk about turbocharging to head to the comments section down below, where I will be more than happy to read your incredulous responses and/or informative opinions. The boosted air then flows through the intercooler and into the intake manifold. 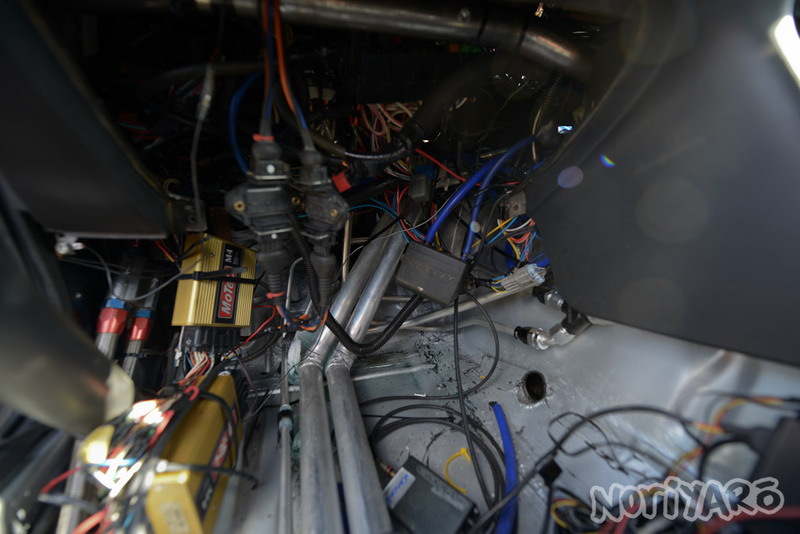 Somewhere in the middle of all that is a water/methanol injection system to keep the inlet charge somewhat cool. 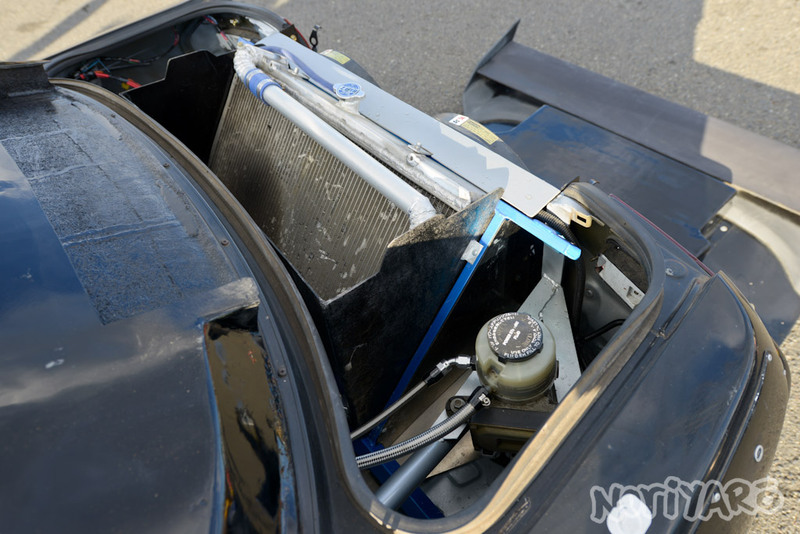 The thing on the right is a supplemental radiator that is plumbed into the heater core lines, since the car has no HVAC system. Despite being a bit ugly, Takuro says it works quite well. 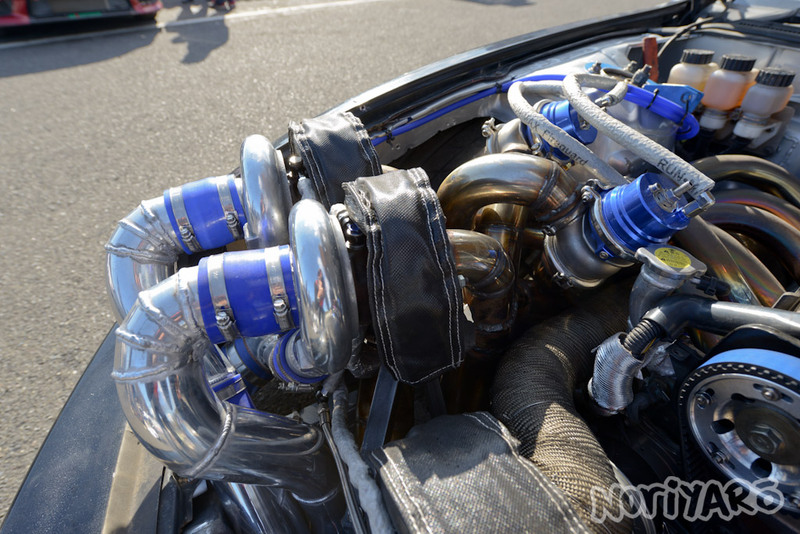 All those snails need to be supplied with exhaust gas obviously, so Takuro fabricated a complicated exhaust manifold where the front three cylinders feed one TD-06/T88 compound pair, and the rear three feed the other pair. Each turbo has its own individual external wastegate which is used to control the staging of the turbo boost. Let’s take a look inside this fevered dream which is the Silvia’s cabin. Is that some sort of DIY kitchen accessory posing as a grab rail? Auto electricians, please close your eyes, scroll down for a bit, then open them again. The braided lines on the left are for the rear side-mounted oil cooler, the two pipes running down the middle are for the rear-mounted radiator and the small line next to that is for the rear-mounted power steering pump. Something I didn’t ask about was exactly how the Motec ECUs are setup to control the engine, and why there are two of them. This Tilton pedal box has been in the car for a while now. 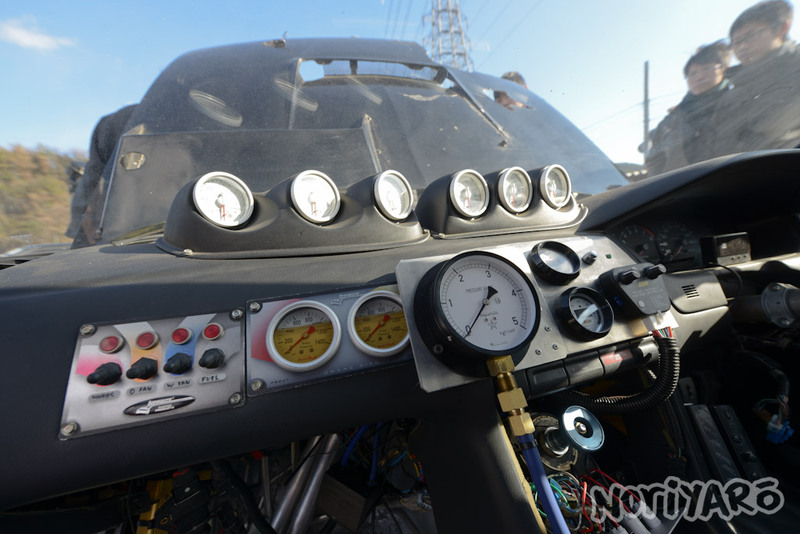 Here we have some brake bias gauges, a huge mechanical boost pressure gauge, the methanol injection system over on the right, and a big old-school Trust mechanical boost dial. The 2JZ is fitted with a six-speed Supra transmission. The purple thing is the fuel filter. Welcome back to all auto electricians. Please ignore the left side of this picture. 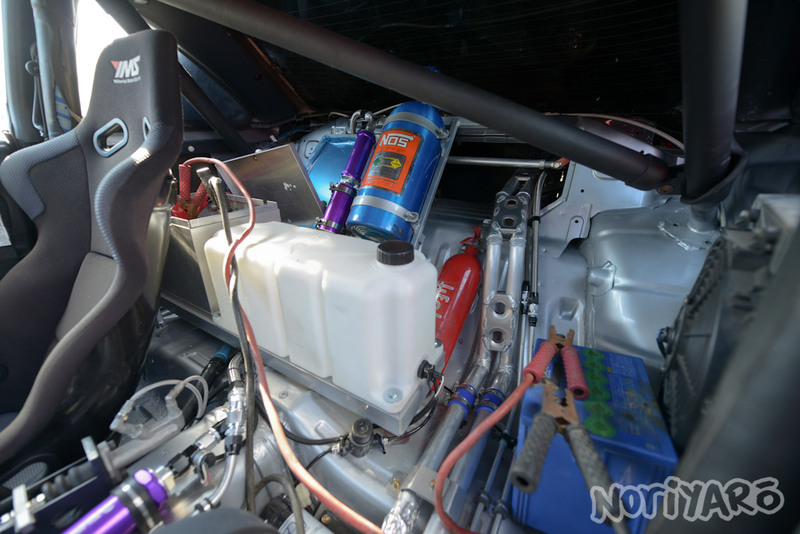 In the back, we have the tank for the methanol injection mix, battery box, 100hp fuel pump, NOS bottle (only used as an intercooler and radiator cooling spray at the moment) and fire extinguisher that wasn’t yet installed. 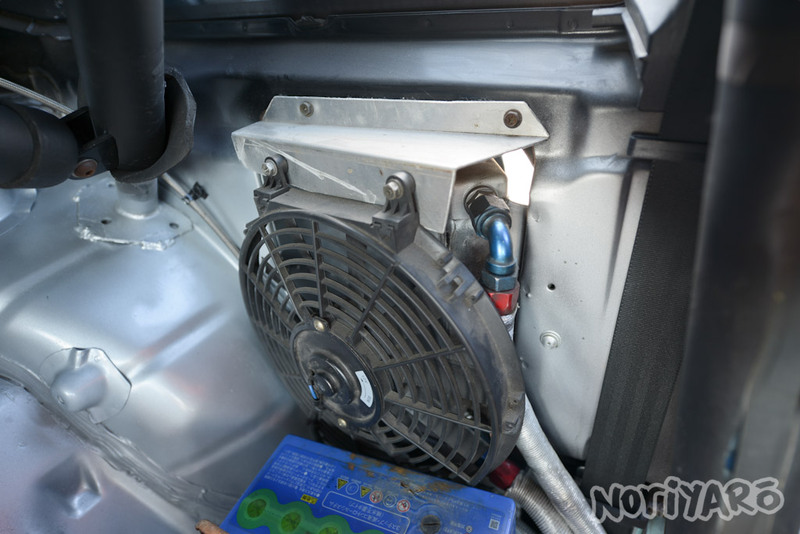 This is the oil cooler, which is mounted to the side of the car just behind the passenger’s seat. Here’s how it looks on the outside. Nikko’s fastest corner is a long right-hander, so it should work quite well. The last time I saw cars as weird as this was at Gatebil in Norway, but even they weren’t quite this mad. It looks very Bruce Wayne-spec from this angle. Takuro also made these Aventador-like intakes for the rear-mounted radiator system. 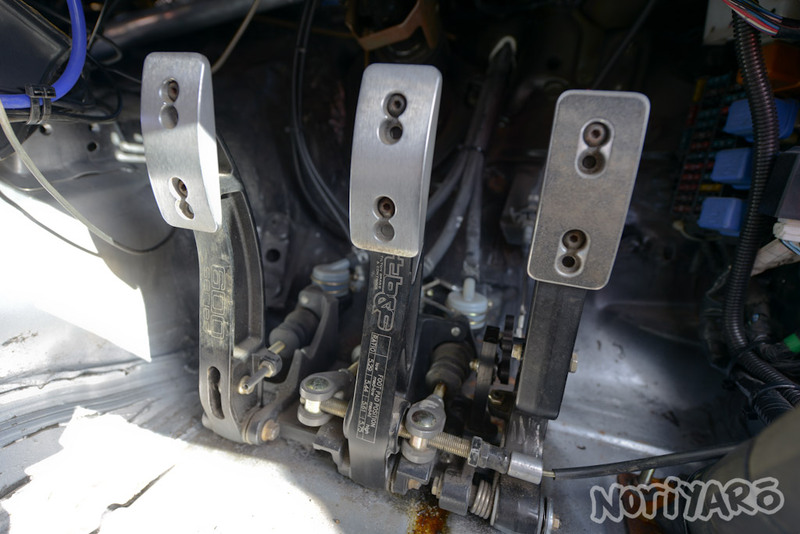 The rear mounted radiator and electric power-steering pump, scavenged from a Toyota MR-S.
Takuro added a fabricated barbell weight to try and balance the car a little bit. Overall however, the car doesn’t look too far removed from a regular tuned S14 Silvia. 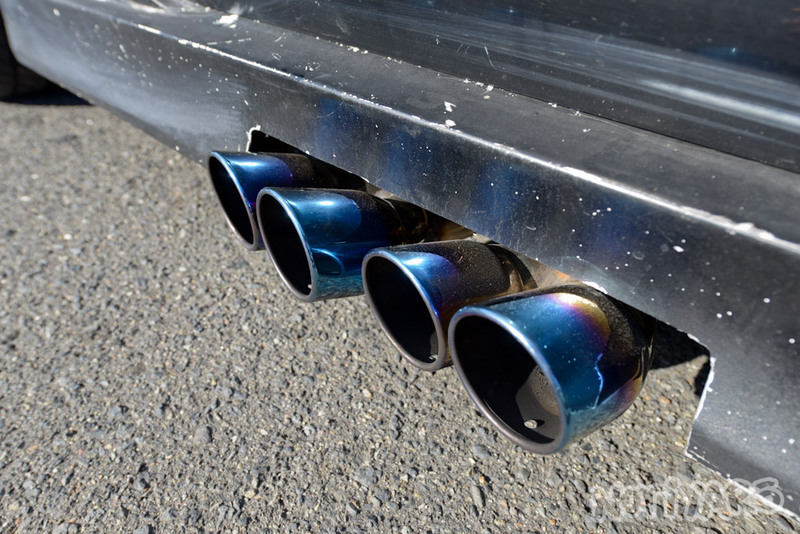 These side-mounted exhausts are for the four external wastegates. The rear wheels are in drift-spec at the moment, but I did see this car a long time ago wearing semi-slicks on all four corners. The brakes are about as serious as you’d like to have on a car like this. This event was put on by Takuro, so he was running around for most of the day while his assistant/mechanic fettled everything and attempted to get the thing to run properly. According to him, they were up late the night before trying to finish to car so they could at least do a shakedown run at the event. As you can imagine, getting the wastegates to stage the boost properly was giving him some headaches. 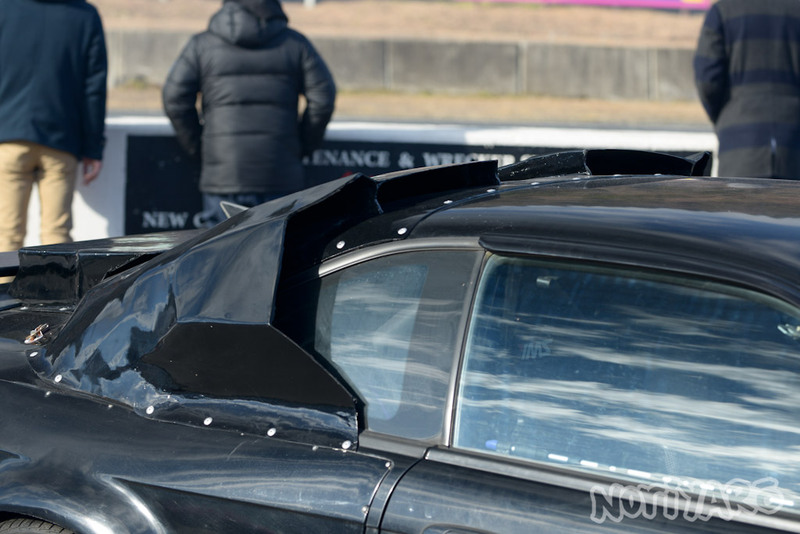 With an empty track and everyone watching, Takuro took the car out onto Nikko Circuit for some demonstration laps. 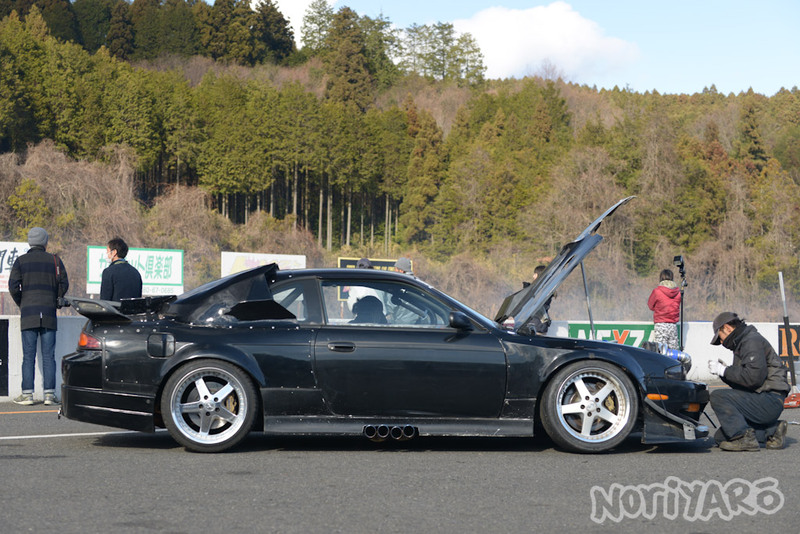 From what I saw, it didn’t appear to be any laggier than a regular 2JZ with a big turbo on it. Unfortunately, he only managed about three laps, with his assistant messing with a laptop and every single knob and dial in the cabin, to no avail. A lack of time for a proper wheel alignment meant the car was all over the place and not very controllable. Takuro didn’t feel comfortable risking the car in that state, so he brought it back in to the pits to a round of applause from the crowd. It made decent smoke though, and that was only with a maximum of 1.5 bar of boost. Well, with a lot of manufacturers starting to look towards “downsized engine” technology to increase efficiency and performance in new cars, this kind of turbo setup might be seen as normal in the future. Better that than hybrids, in my opinion. So what’s next for this car? 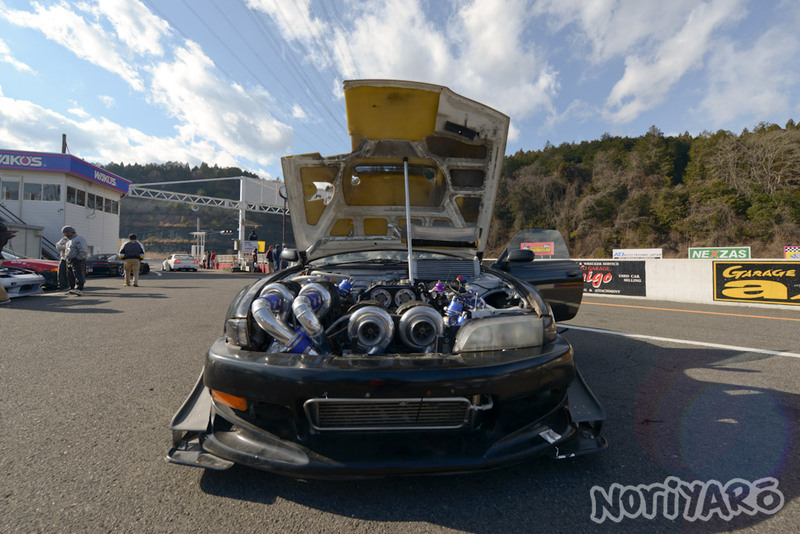 According to Takuro, another turbo. Post a vid of this silvia. Would love to hear and see how a quad turbo 2jz . Cheers!!! Hey alexi! Big fan, love your work! I’ve been eagerly waiting since that first Instagram post to see this car! This thing is insane! I was just wondering what amount of horsepower this thing has? Cheers Noah. Big fan from Brasil, you’ve doing a great work! Cars like this are the best part of tuning culture. Put together with a sort of shrugging “why not?” mentality, ignoring established styles and opinions, and throwing practicality out in favor of sheer “sugoi desu yo!” thinking. Meu que loucura esse carro! Realmente um projeto bem montado com toda dedicação e atenção desse mundo! A Caroline Racing sempre inventa coisas que somam mais ainda para o mundo do Drift, eu sou um brasileiro apaixonado pela cultura do Drift e de uma coisa eu tenho certeza, esse carro vai ser bem louco andando de lado hahahaha Parabéns pela matéria muito bem feita, faça um vídeo para gente ouvir esse 2JZ berrando com esses 4 turbos hahaha, um grande abraço daqui do Brasil!!!!! Exhaust gases run to the TD06, where the downpipe and wastegate exit both run to the T88 which has a DP and WG of its own, leading to the exhaust system (and/or screamer pipe). Would be nice to see some figures! Great writeup and explanation of how it all works! I love that the internet trolls thought this was fake and now they can once again, eat their words! I love crazy people that try new things. I don’t really know anything about cars, but damn so much respect! I wish i had could just buy a car and mess around with it until i knew how it worked! Well they way I heard about this type of “staged” or compound turbocharging was from a legendary 900 ci yes inch Cummins V8 with 6 staged turbos of varying sizes running 3 on each bank. This is the Ten & Co drag semi that was built like thirty somethin years ago. But the concept of staged turbos is to have varying size turbos that hit their strong boost onset or spooling point at different points in the engines powerband so your not stuck with the spooling characteristics of just one turbo. I’m not absolutely sure about the downsides to this setup but there is another forced induction setup called compound supercharging which is the combination of a supercharger and turbo which has a very broad powerband from the charger taking care of the low end of rpm power then the turbo fills in the high rpm power. Realmente es increible como progresan los japoneses dia a dia! Tienen todo tan bien controlado, estas personas trabajan dia a dia, años para poder llevar a cabo este tipo de proyectos! Saludos! Noriyaro esta cada dia mejor! Why not just have the ol fashion twin turbo set up and one smaller n then one larger kinda like a older 300zx tt but on a bigger scale ? I love boost as much as the next car guy but I almost feel as 4 turbos isn’t practical ? I understand there trying to get a power that is equal all across the range of the Rpms I guess ??? How can I find a dyno run on this beast? Wanna see the numbers and how efficient it can be ! Just a little question, how much horsepower does this beast have? More than a thousand on a rear wheels, right? 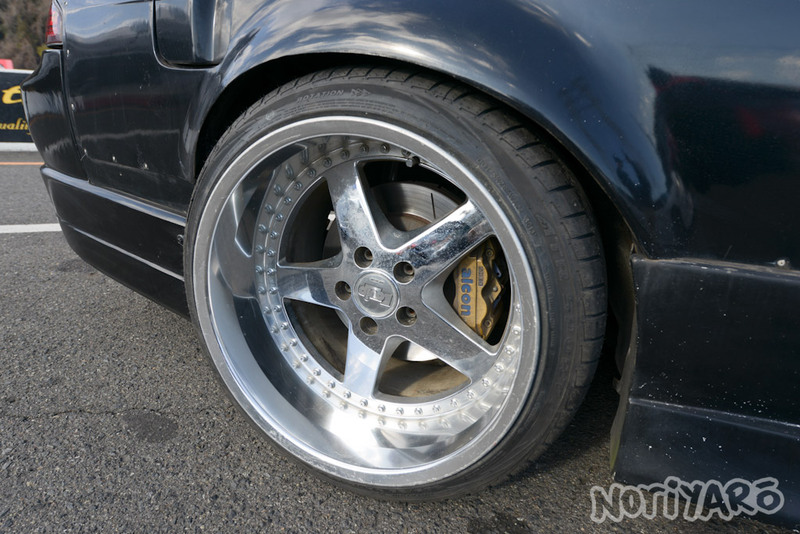 is ther any drift event next weekend in japan maybe at 21or 22th of march ??? or any good place to see some drifting . iam in ishikawa prefecture right now but can travel . can i make a question please ? why dont u use a other Intake System ? i actually had an Idea for that ! when u really wanna run and drive big boost.. why dont you make a Cylinderhead adaption ? i mean .. Mitsubishi still had Fuel Direkt injection on some cars ! why dont u make a intake manifold change into a pressure saving system ( for all the produced boost ) . Then throw out the mechanical intake valves and do it like the Diesel way. The Common Rail Diesel have high pressure Fuel rail, why dont u build a high pressure Air rail ??? Think about that, when u then still have no Lag anymore and can easy programming the intake boost drectly into the cylinder . what u then just need is a electromagnetic “Air valve” in your Cylinderhead and a high precision Air pressure sensor into the Intake-pressure-save-cannister. Then u can create your own fuel air combustion system. maybe for high speed running, and maybe for ” crazy driving .. with big fuel injection for Flames in the exhaust … ignition timing and more. Maybe then comes All togheter ! And u can controll that by your own Software. I am not an Import guy but….damn,I am a fan of anything mechanicly insane…still wondering were the flux capacitor is? This thing has to over heat like instantly at any speed under like 120? Who cares about the science behind the scene! I’m just curious to know how much horsepower and torque this thing laid down? What does the 100hp fuel pump refer to? Was it a typo?